A one bedroom first floor furnished apartment converted from a period style property close to a plethora of shops, bars and restaurants and a multitude of transport services in West Hampstead. (3.9m x 2.2m) Kitchen wall and base units. Gas hob. Electric oven. Integrated fridge/freezer. central heating boiler. Recessed lighting. (4.5m x 2.3m) Double glazed window. Radiator. Panelled bath with mixer taps and wall mounted shower attachment. Low flush w.c. Wash hand basin set within vanity unit. Towel radiator. £310.00 per week/£1,343.33 per month exclusive. Inventory check in fee £120.00 including VAT. Before the start of the tenancy you will be asked to pay one month’s rent in advance and a deposit equivalent to 6 weeks rent. 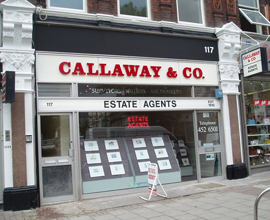 Callaway & Co., require a holding deposit of one week’s rent to reserve the property, this payment will form part of the initial rental payment is not an additional payment should the tenancy proceed.